"From the moment we stepped trough the door of Danny Cottage, we knew that no other place will compare during our stay in the countryside....The cottage of our dreams." 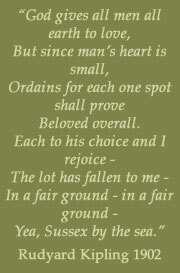 "All of us are unanimous in saying what a lovely holiday we had at Danny Cottage.. you have catered for our every need." "Thank you for creating an idyllic Downs retreat." "We were so proud of the place, we loved showing it off to our friends and relatives." "One word: Glorious! Thank heaven we are coming back next year!!" "...wonderful country, that pleasant area, that typical village, this marvellous cottage..."
"A fantastic week - the cottage is impeccable, the furniture, the flowers, the fittings, so this is what it is like to live in a Country Life Magazine!" "We wanted for nothing, fully equipped and such attention to detail in the décor and fittings it was a constant delight to enjoy." 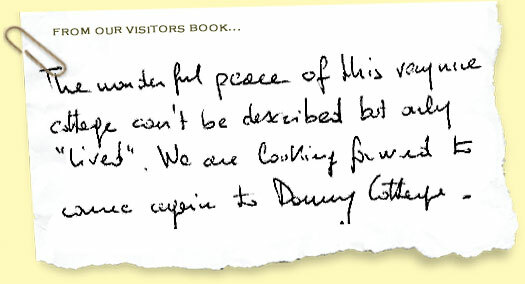 "Many fond memories of our time here in Danny Cottage- such a charming, special place...everything has been perfect." "What a glorious treasure, Thank you." "This remains a real paradise for walking and pub addicts and peace and quiet is assured 24 h a day." "5 Star luxury, peace and beauty." "A chocolate box's cottage in a wonderful setting, the modern facilities make it a complete ideal place." 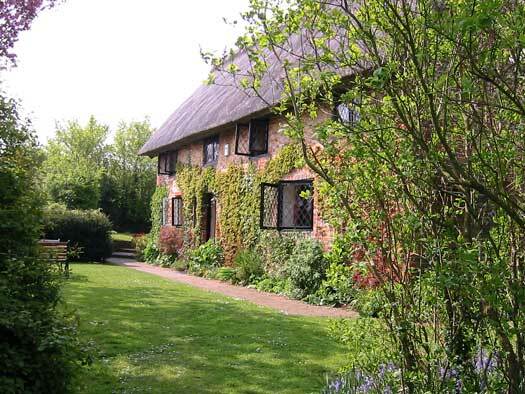 "An excellent week - we've enjoyed the whole package - Danny Cottage, the Village and surrounding countryside." "We had a great time... hope to be back." "Quite the most charming, well equipped home away form home... I didn't want to leave." "We had a wonderful week at this outstanding lovely place." 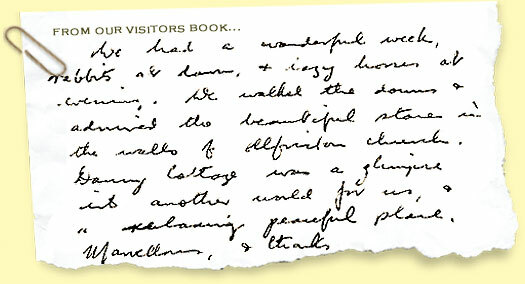 "The cottage was marvellous and we have had a wonderful time here at Danny Cottage." "It is a joy to be here." "The scenery and the beautiful surroundings will stay in our memory as will the hospitality shown us through out our stay. We look forward to returning."